If there's one thing that can help mend a broken heart, it's saving another. We lost our Franky. But then our hearts felt a familiar tug when this little girl came along. At 12 years old, Tammy found herself in a shelter after 9 blissful years with her elderly owner. 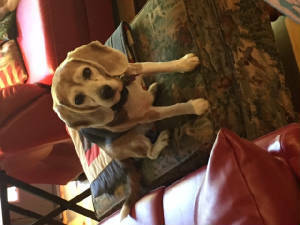 That's because her owner passed away and his family had no intention of taking over the care of his beloved old beagle. Welcome to the BOB Family, Tammy Faye. We love you already.